A good, thoughtful friend posted a fair question at the end of my bibliography the other day (a bibliography which described just a handful of books that illustrate the range of views and writing on the subject of the cross.) She basically asked that if some thinkers suspect that “penal substitution” and “paying a price” for our sin and averting God’s wrath isn’t the most basic reason Jesus came to Earth, and isn’t the point of the cross, what else could it possible be? Oh my, what a good question. Of course, my bias tends to be fairly traditional on this question, so I wouldn’t recommend just any hare-brained books that come along. I am not proposing that Jesus’ cross accomplishes anything less than the reconciliation of all things back to Himself (Ephesians 1:10; Colossians 1.) As a few of the books which I mentioned show (like the one by Piper) the Biblical witness names a number of different things accomplished by the death of Christ. 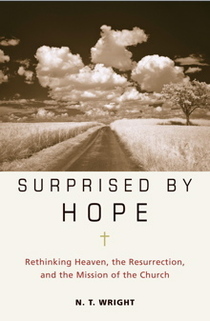 New ideas of just how that happens, which verses are more literal, and which wax metaphorical, which we understand clearly and which take some historical/cultural background to understand, and how best to say it all, are worth knowing about, especially if they suggest that the more typical formulations (especially in evangelical piety) are themselves somehow not inherent in the Biblical text. I certainly cannot answer the question simply, which is why I recommended books that might. I don’t mean to be cheap, but the answer is, partially: well, if you really want to know, read some of these books, or read about them, at least. It is a bit complicated, isn’t it? That’s why these books are there and it why we commend reading widely. For starters, you could check out wikipedia on atonement, penal substitution, or justification, for instance, which describes in fairly objective fashion, some various figures in church history that have had different theories about how the effecicy of the cross works. And, please recall my suggestion that we be open-minded and gracious as we read and learn and discern and discuss; the website that was linked in the comment has some pretty firm comments, verging on smug nastiness, I’m afraid. Another website had ugly, self-rightous comments, such as one about a writer which said he (or his views) were “garbage. And that is an insult to garbage.” This from a person defending a high view of the Bible and mature doctrine. So sad. I recently re-read C.J. Mahany’s little book on humility called Humility: True Greatness (Multnomah; $12.99) and it was wonderful hearing from a staunch Calvinist that we must seek truth and charity, clarity and graciousness. It is a deeply theological work, yet sweetly practical and sensible. It seems to me that we can say this much quickly when we are asked “why the cross?”: the bigger question is what was Jesus all about, what was His mission, and how can the specific statements such as “The son of man came to give his life as a ransom for many” or “I came to seek and save the lost” or “I came to bring a sword”) be harmonized and related properly, but in some overall sense of meaning? What is the largest context to make sense of the life and teachings, death and resurrection of the Christ? Jesus came, it seems to me, to fulfill the promises to Israel and establish a Kingdom “on Earth as it is in heaven.” His inaugural sermon in Luke 4 in which he plainly says why He was anointed with the Spirit and what he purpose was, cites Isaiah 62 which everyone knows is an allusion to Leviticus 25, the Year of Jubilee, the every 50th sabbath year—announced on the day of atonement—when through grace, justice would be done, economics would change, land would be healed, and everybody in the community got a second chance, poor and disabled and imprisoned alike. Jesus famously then said that in their hearing, this Jubilee had come to pass! When he implied that this gracious regime change might include outsiders, they wanted to kill him. Garbage, I guess. In the synoptic gospels, whenever the “good news” is mentioned—the same good news that the complex apostle Paul proclaims and explains—the phrase “the Kingdom” is what is being discussed. (“Preach the Kingdom to all creation” it says in Mark.) The details of justification through God’s grace, how election and the atonement happens, the necessary imputation of righteousness, and all the rest, are, it seems to me, how details of how one enters the Kingdom. That is, the cross is not the gospel, God is not the gospel (as John Piper puts it in one lovely if misguided book by that name) but the Kingdom come is the gospel. Of course the mainline liberals of the 20th century were wrong: the Kingdom is not just “deeds without creeds” or mere social humanism or even liberation from injustice. One need not be a social gospel theologian to take Matthew Mark and Luke, most obviously, at face value when they say that the gospel is “the gospel of the Kingdom.” Therefore, the role of the cross is to defeat Death and allow us to enter the community of the King. It is not the point of the gospel, it is the entrance to the gospel. So, while we indeed need to get our doctrine(s) of justification and atonement right, we who understand it will revel in the meaning and glory and mystery of the cross, we dare not leave it at that. We are to proclaim the foolishness of the cross, which stands for so much more than the fine news of being forgiven (however we best describe that holy transaction.) We are converted to be fit for the Dominion of the King, which is the great good news. Those that follow these things will know that I’ve long believed this Kingdom definition of the gospel, owing much to everyone from Abraham Kuyper, Hermann Ridderbos and Al Wolters to Ronald Sider, Howard Snyder and Jacque Ellul. A simple little book that says it wonderfully is called Kingdom Come: How Jesus Wants to Change the World by Alan Wakabayashi (IVP; $13.00) which we highly recommend. 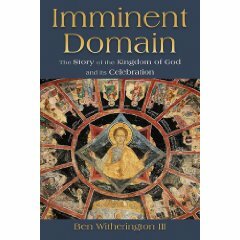 A brand new one delightfully called Imminent Domain: The Story of the Kingdom of God and Its Celebration (Eerdmans; $12.00) just came out by Ben Witherington III, a fine Bible scholar from Asbury Seminary in Kentucky. Just fabulous! Of course the Kingdom themes animates some of the best work being done about “the missional church” (Gruder et al.) This isn’t new stuff. w I blurted out that it was one of my all-time favorite books. I don’t think I was grandstanding, either. I really think it is brilliant stuff, very important and very helpful, bringing together a missional vision, based on an understanding of the inaugurated Kingdom, secured by the Victory of the resurrection, prefigured in the bodily resurrection of Christ. No, no, no—readers of BookNotes surely know—Jesus didn’t die just to get us Fire Insurance, so we don’t go to hell and can live in heaven forever as angels. Ugh. The Bible insists that we can have abundant life now (John 10:10), that he rose in the flesh, and we say, with the Apostle’s Creed, that we believe in resurrection of the body. That, of course, means, our bodies. In a (re)new(ed) Earth—paradise regained, creation restored, heaven come down to Earth. It’s the spring coming to all of Narnia, the curse working backwards, after the long Winter under the witch’s power. The death of Aslan isn’t the point, of course, it the return of the rightful King as He restores the place he so loves. The fine-tuned theological scholarship that I commended in the last posts about the cross are prelude to this, bigger, more urgent matter: what is the atonement for? I liked Mark Driscoll’s pastoral letters about the theology of atonement, applying these great truths to hurting people, yet I think it occasionally missed this proper Kingdom vision. (Some truly Reformed guys are so fixated in explicating precise doctrine that they don’t always get to the missional heart of God and the implications of the Kingdom for whole-life discipleship in the world.) I’d want to say that the point of the cross is so we might fulfill Matthew 6:33 and seek only the reign of God, Christ’s Kingdom. I believe for Paul, “the cross” is shorthand for “the gospel” and that is always understood as the reign of the victorious and ascended Lord. God promises that all will be well for those who have such hunger and thirst for His righteousness, which cannot be divorced from the call to serve God in the world. This can be seen as nearly begging the question of what the cross, qua cross, means. I hope you don’t think that of me today, since my last two posts commended serious reading on this specific topic. I now just want to put it in broader context. John Stott’s wonderful book on the cross which I touted, by the way, seems to do a bit of this, and I am glad. As always, he is a reliable and balanced source. N.T. Wright, though, does a very great service in helping us with this Kingdom vision of a hopeful future, but, for what it is worth (and it is worth quite a lot in my book) he also is a careful, creative, Biblical theologian on the finer tuned systematic stuff as well. For instance, here is a long article by Bishop Wright that discusses a few books/authors/positions on the atonement, even offering some very serious critique to a book which I wanted to highlight in my bibliography (Pierced for My Transgressions: Rediscovering the Glory of Penal Substitution by Steve Jeffery, Mike Ovey & Andrew Sach) It was getting a bit long, and it is a serious work, so I deleted my annotation. Wright is perplexed why good evangelicals think the book is so Biblically-rooted when he thinks that it is demonstronably not. In one hefty must-read article, Wright exposes the inadequacies of the right and left, liberals and conservatives, and offers this Kingdom vision that tries to take quite seriously the nature of the unfolding Biblical narrative, the Jewishness of Jesus and the covenantal echoes in the epistles, rather than merely cite strung together prooftexts, read through a lens of medieval or modern hue. I think it is very well worth reading, especially to anyone who nodded when Becky posted her fine query. For those who were intrigued by the books about the non-violent atonement, I might suggest this overview, from the justice & spirituality journal, Clarion, which is a good introduction to this project and why it is valuable. It is excerpted from Brad Jersek’s chapter in Stricken By God? AND, lastly—a drum roll, please: we can now take pre-orders for a marvelous new book that is coming out in May on this exact topic, a thoughtful book by N.T. Wright in response to the good critique written of his views of justification written last year by John Piper. As you can see, it will be called Justification: God’s Plan and Paul’s Vision (IVP; $25.00.) It is important, not least because there are so many folks wondering exactly where he stands. You may recall that I did a fairly favorable mini-review of Piper’s fair, fascinating (and very informative) critique of Wright (which was called The Future of Justification: A Response to N.T. Wright.) I have to admit I’ve got a glimpse of some of this—Wright’s response to Piper and others— and it is very, very rich stuff. We’ll be offering a big blog special when it arrives—25% off–so you can order it now if you’d like. We still have copies of Piper’s book, too so you could order that, too. It usually sells for $17.99. While supplies last, we have some selling for $10.00. Just let us know if you want the Piper one now, or if we should send them together, when Wright releases in a couple of weeks or so. hehe… I know you wouldn’t recommend any old harebrained thing. I think I should preface this by saying that I am pretty biased towards N.T. 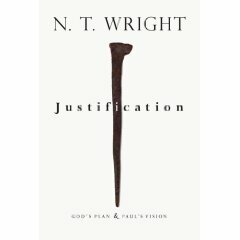 Wright, and I have not read Piper’s book about justification (or anything by Piper). I did want to comment briefly on this, because it’s something I have found myself discussing recently, since we used Wright’s book Paul:In Fresh Perspective for a course I’m taking right now. Anyways, as I read Wright, the thrust of his arguments about justification turn on his apocalyptic understanding of Paul. Maybe I’m conflating, but I think he is somewhat in line with Yoder and Barth in his understanding of Paul. How this works out, is that Pauls is read first as making eschatological claims, not claims about salvation as the Reformers understand it. Wright deals with this when he talks about “inaugurated eschatology” in the book I talked about above. As such, I find it frustrating to read “critiques” of Wright that basically say since he is not affirming a Reformation soteriology, what he’s saying is dangerous. I do not know if Piper says this, although I suspect that he does. it’s the position I’ve seen taken by most people who can, broadly speaking, be called Reformed. I do not mean this as an underhanded swipe at Piper and I hope it doesn’t come off this way. I respect his work as a biblical scholar and I have no reason to believe that he isn’t charitable to Wright in his book, as I’ve seen noted by Byron and others. What I will say is that I don’t see this as an argument, because Wright pretty much says as much multiple times in this book and in other places. Simply arguing that because Wright does not operate with a Reformation soteriology he is wrong is fallacious. If that position is held to, I’m fine with that, but not as any sort of critique of Wright. As I understand him, any critique of Wright’s understanding of justification must deal with his apocalyptic reading of Paul. (Interestingly, as an aside, there is an enormous book coming out this summer (1300+ pages) on an apocalyptic reading of justification in Paul that Wright has written the forward to). 1. I haven’t read it, but I suspect that a good book to read when considering penal theories of atonement is J. Denys Turner’s The Nonviolent Atonement. It’s a book I’ve been meaning to read for a while, and I’m not sure if Byron lists it as I skimmed some of the post quickly. I’m not sure I’m committed to penal substitution. At the very least, in my opinion, it’s a metaphor, and if pushed too far, like any metaphor, it’s untenable. 2. Byron, which Pittsburgh talk show were you on? I would like to try to find the interview online! And by J. Denys Turner, I actually mean J. Denny Weaver! Should have looked that up first! I’d guess I’ve made specific reference to the work of the cross in about 95% of the sermons I’ve preached over the last 7 years. Maybe a handful have talked about penal substitution. Maybe. I’m not anti-penal substitution. I’ve not tried to avoid it– just the caricature of it. My primary concern is to speak the text faithfully. And penal sub’s just not in the text as much as people assume. For instance, the way some people talk you’d assume that the OT is all about sacrifices to atone for sin. Sure it’s there, but it’s a minor theme. The gospels are quite content to simply evoke and imply a theory of atonement. But it seems to me that what’s evoked and implied most is not penal sub. It’s Cristus Victor, baby. Over and over. What’s also interesting (and a bit disheartening) is that most of the time when I ask people to tell me what the work of the cross is they give me penal sub. Man, I’ve got to get back to work. I realize I need to qualify my remarks. I’ve preached plenty of sermons which have elements of penal substitution– Christ taking upon himself our sin and shame, etc. It’s the idea of God punishing Jesus instead of us that I avoid. Not that it’s not biblical, but I just find it hard to preach that in a way that enables 21st century postmoderns to hear it correctly. . . okay this is far too complicated an issue to address in a comment box. Thanks for your good post, Mark…you are a good man, and I’m confident a great preacher. (Are you still funny, too? Dude, I hope so!) Your testimony as an orthodox and faithful preacher means a lot to me. I hope others read your note carefully. Grace & Peace. Our saturday morning men’s group has started using Mahaney’s book on “Humility” and we had a great, ‘humbling’ discussion and prayer-time the other morning. The Process that is True Religion is a celebration of The Beautiful. Anything other than that is an abomination. Not much beauty to be found in the first two images at the top of this essay/posting by you. Plus isnt the image on the Justification book that of a nail? Try driving a nail into the hand of a friend and see how beauty you can find. Fair enough, although some would say that the art works shown portraying that occasion contain great beauty, mysterious beauty, which may be why they’ve endured for centuries. A bit glib or elitist or something of you to say there is not much beautify in them. Although maybe they aren’t for beauty, but for truth-telling, which is beautiful in its own way. But I think I get your drift..
I’m curious though: what do you mean by the “process that is true religion.” That is a phrase I’m not familiar with, a process that is “true religion.” I suppose I’m not too interested in that kind of a “religion”, although I am interested in the person of Jesus and the process of figuring out his message, life, death, and resurrection, and our response to it. You assert that the process is a “celebration of The Beautiful.” And you tell us that anything other than that is an abomination. Hmmm. If you read our blog you know we often discuss books about the arts and aesthetics, although I’m not sure why you insist that The Beautiful is the true religion. What makes you say that? Who says so? What is “The” “Beautiful”? Any thoughts to share? The author of https://www.heartsandmindsbooks.com has written an excellent article. You have made your point and there is not much to argue about. It is like the following universal truth that you can not argue with: When annoying people do something often you will eventually find this activity annoying as well. Thanks for the info.